The human brain is a fascinating, mind-bogglingly complex part of the human anatomy. More intricate than any other part of your body, it is "grand central station" for personality, thoughts, calculations, bodily functions of every kind, and, of course, memory. And today is a day to remember. It's a legal holiday set aside honor those who went before us, fighting for our country - giving their lives so we can be free. It's a popular day for barbecues and picnics and other outdoor activities - it is the "unofficial start of summer," after all. And for some, that's all it is. But that's not how it should be. 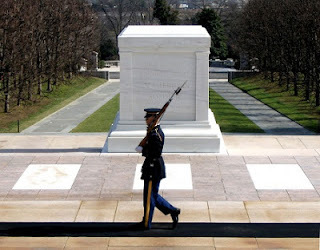 Those who made that sacrifice for us deserve to be remembered, to be honored. Of course, forgetting isn't only relegated to holidays such as this. God's Word is full of people who forgot things and were the worst for it. Again and again, the Israelites forgot the Lord's promises to them and went their own way. Solomon forgot the teachings of his father David and followed idols. King Joash followed God's ways - but only while Jehoida the priest lived. Once this man of God died, Joash forgot all the good and went His own way. And the list goes on. God teaches us lessons every day - through His Word, the Holy Spirit, other people (even nonbelievers sometimes! ), books, nature, circumstances - you name it, He can and has used it to bring us closer to Him - to make us more like His Son. On this Memorial Day, do not forget.